As per existing Government guidelines for Govt. / Pvt. (Minority/ Non-Minority) Medical & Dental Colleges and Army Dental College. The details of seat matrix will be placed in the web-site http://knruhs.in /http://tsmedadm.tsche.in. 1) The candidates can exercise web options through http://tsmedadm.tsche.in from home or any other place having internet facility. Use only system with Internet Explorer version 10 or above. Do not use Tabs or Mobiles to exercise web-options. 2) Candidates can make use of help-line centers at K.U. Campus, Warangal, PGRRCDE, OU Campus, Hyderabad, JNTU, Hyderabad for exercising web- options from 9.00 A.M. 5.00 P.M. on the dates specified above. 2) Candidate can exercise options for MBBS/BDS Courses in all the Colleges as per the eligibility. There is no limit to the number of options. 3) Candidates are advised to read the regulations and prospectus carefully before exercising web-options. 4) Candidates are informed that they have to give options to the course and colleges in which they are interested to join. In case the candidate does not join the course / college after allotment he / she will not be allowed to exercise web-options in subsequent counseling's. 5) One time pass word will be sent to the registered mobile number at the time of exercising web-options. The pass word consists of SIX letter code with English capital A to Z. 6) Candidates are instructed to take a print out of saved options. 7) Candidates will receive the message on their registered mobile after allotment of seat, if allotted. 8) Candidate has to down-load the allotment letter by paying the University fee through payment gateway. 9) Candidate has to take print out of allotment order, check their allotment and report to Principal of respective college before the date specified on the allotment letter. 10) The selected candidates shall report to the Principal with all original certificates, bond, and pay the college fee before the last date and time at the allotted college as mentioned in the allotment letter. 11) Original certificates will not be returned to candidates unless the candidate discontinues from the course. 12) The University fee and other fees once paid shall not be refunded under any circumstances. 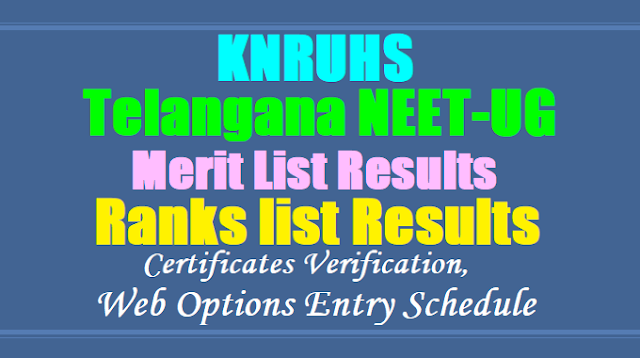 KNR University of Health Sciences, Warangal, Telangana State hereby notify that the first and final verification of certificates for Web Based Counseling will be conducted for Admissions into MBBS/BDS Courses for the academic year 2018-18 into Medical and Dental Colleges affiliated to KNR University of Health Sciences, Warangal, Telangana State. The candidates those who have qualified in NEET UG 2018 and registered on-line and paid the Registration / Processing Fee in response to notification for Competent Authority quota seats, whose names are displayed in the provisional merit list of KNR UHS are directed to attend the verification of Original Certificates for Web based counseling for admission into MBBS / BDS Courses for the academic year 2018-19 into the Telangana Government, Un-aided Non-Minority, Un-aided Minority Medical Colleges, Government, Un-aided Non-Minority Dental Colleges( including Statewide college) in the Telangana State at the following Help line Centers as per the schedule given below. 2. KAKATIYA UNIVERSITY CAMPUS Warangal. 2) Candidates attending Certificate verification at Hyderabad have to attend at specified centres as per the scheduled given below to prevent over crowding at one centre. 3) Special category candidates (Sports/NCC/PMC/CAP/Physically Challenged) have to attend certificate verification at JNTUH, Kukatpally, Hyderabad as per the schedule given below. 5) Candidates whose category certificates (SC/ST/BC) are issued by Government of Telangana should attend certificate verification at Help-line Centres in Hyderabad / Warangal only. 6) Candidates whose category certificates (SC/ST/BC) are issued by Government of Andhra Pradesh should attend certificate verification at Help-line Centres at Dr. NTRUHS Vijayawada only. 1) All Candidates, who fulfilled eligibility conditions under OC / SC / ST / BC category belonging to Telangana State and whose category (Community Certificates) issued by the MROs / Tahsildar / RDOs from Telangana State only and candidates claiming 15% un- reserved seats from Telangana State only, i.e. the candidates who have resided 10 years in the state of Telangana are also to attend for verification. 2) Local candidates whose category / community certificates issued by Govt. of A.P. are to attend Dr. NTRUHS Vijayawada centre only and to submit declaration in Rs. 100/- Stamped paper and to submit certified copies of Aadhar / Ration Card of candidate and Father. 1 The candidate should be an Indian National or Person of Indian Origin (PIO) / Overseas Citizens of India (OCI) Card Holder and should satisfy the Local or Non-local status in Telangana State (Residence requirement) as laid down in Andhra Pradesh Education Institutions (Regulations of Admissions) Order, 1974. Selection will be done as per the procedure laid down in the G.O.P.No.646, dated 10.07.1979 as amended in G.O.Ms.No.42, Higher Education (EC2) Department, dated 18.05.2009. 3. The candidate should have qualified in NEET UG 2018 and should have registered on-line and whose name is displayed in the Provisional merit list on the KNR UHS web-site. 4 The Candidates should have completed 17 years of age as on 31-12-2018. The candidates who do not complete 17 years as on 31-12-2018 need not attend the counseling. The candidates born on or after 02-01-2001 are not eligible for admission into MBBS/BDS courses. 5. The candidates who wish to claim seats under Anglo Indian, Sports & Games, CAP (Army), NCC, Physically challenged (PH) and Police Martyrs Children (PMC) also need to fulfill the above eligibility criteria in addition to eligibility criteria of respective categories as per existing Government regulations. The candidates are directed to bring all the original certificates (mentioned below) along with two sets of self attested Xerox copies and print out of on-line application form duly signed with photograph affixed at the space provided. Custodian certificates are not allowed. Candidate has to present in person. 1. Admit card of NEET UG 2018. 2. Rank card of NEET UG 2018. 8. Candidates claiming eligibility of reservation under Special categories should furnish the required certificate in support of their claim. 9. Permanent Caste Certificate (Integrated Community Certificate) claiming reservation under BC/SC/ST Categories issued by an Officer prescribed. 10. Minority status certificate if applicable. 12. Self Attested copy of Aadhaar Card of candidate and Father. 1. Candidates are hereby informed that, this is the first and final phase of verification of certificates. No further phase of verification of certificates will be done. Candidates who got verified their original certificates are only permitted to exercise their web options in the subsequent phases if any subject to their eligibility. 2. Candidates have to present in person along with all Original Certificates for verification. Custodian certificates will not be allowed. 3. Candidates whose category certificate (SC/ST/BC) issued by Telangana state should attend for certificate verification at Help-line centers in Telangana. 4. Candidates whose category certificate (SC/ST/BC) issued by Andhra Pradesh state should attend for certificate verification at Help-line centers at Vijayawada. 5. Special category candidates should attend certificate verification at JNTUH. Kukatpally, Hyderabad. 6. Mere attending for verification of certificates does not confer any right for admission as more number of candidates have applied for limited number of seats available. 7. Notification for exercising web-options along with schedule of dates will be displayed on KNR University web-site. 8. Orders issued by Government of Telangana from time to time with regard to admissions into MBBS/BDS Courses will be applicable.